It also provides magnesium and iron, other minerals which keep your body running smoothly, and you'll be happy to hear that iron coming from plant based and other iron rich foods simply does not get absorbed as quickly and effectively as the one coming from fish. That means better absorption of iron in your diet. Not only is this a healthy meal, it also looks good, and is extremely easy to make! You don't need complex ingredients - garlic powder, soy sauce, vegetable oil, and you're good to go! 1 Lönnerdal, B. O. "Dietary factors influencing zinc absorption." The Journal of nutrition 130.5 (2000): 1378S-1383S. 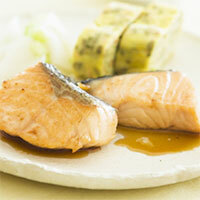 The calories in Grilled Salmon per 86g(1 piece) is 110 calories. Grilled Salmon is calculated to be 128Cal per 100 grams making 80Cal equivalent to 62.5g with 18g of mostly protein、3.6g of fat、0.08g of carbohydrates in 86g while being rich in vitamins and minerals such as Vitamin D and Vitamin B12.